I do; however, hate some of the consequences of social media. The one I hate the most? Phones at the dinner table. While social media is not the only reason there has been an uptick in the amount of phones at dinner table, it plays a huge part. I love my family, but it really bothers me when they’re checking in on Facebook or refreshing their Twitter and Instagram feeds while sitting right across from me. I go to school away from home so I rarely get to sit down with my family to eat a meal. I understand that we might not be talking about something terribly interesting, but I value this time so much so it really irritates me when my loved ones don’t feel the same way. This ad sums up very accurately how I feel in these situations. I’m not ignorant about the situation; I know that I’m guilty of doing this as well, but I really wish I wasn’t. And this seems like the case for most people as a Pew Research Center study showed that 88% of people believe it is generally not OK to use a cellphone at a family dinner. The same study showed; however, that 89% of cell phone users used their phone during their most recent social activity with others. So why do we do it? Maybe we want to see if a friend is going to meet up with us or we want to see what the best item on the menu is at a restaurant, so I get it. But that doesn’t mean the phone doesn’t detract from the interaction. If I’m talking about the food I ordered with someone and then the waiter brings it out, then let’s keep talking about it. Don’t “pause” the conversation to whip out your phone and take a picture to post to Instagram. Because the “pause” button here isn’t really a pause. It’s a stop. Studies have shown that the mere presence of phones detract from interactions, nonetheless using them. A study from Virginia Tech found that “Even without active use, the presence of mobile technologies has the potential to divert individuals from face-to-face exchanges, thereby undermining the character and depth of these connections. Individuals are more likely to miss subtle cues, facial expressions, and changes in the tone of their conversation partner’s voice, and have less eye contact.” This is powerful. While we seemingly gain so much from using social media, we are losing basic human interaction skills, leading to a more anti-social and technology driven world. Even if you’re not worried about the interconnectedness of humans, you still should know this: in a study published by the National Institute of Health, in cases where young adults had high mobile phone usage, there was higher incidence of stress, sleep disturbances, and symptoms of depression. That should get your attention. It might be obvious that social media is partially to blame for this, but a study performed in the UK backed this up. When asked what tends to distract people at the dinner table on their phone, social media sites such as Facebook and Twitter were the biggest distraction as identified by 56% of respondents. Coming in second at just under 50% here was messaging apps and emails, which depending on your definition can also be considered social media. Conversation with others who are not present is chosen over conversation with those who are in the immediate situation. Consider the value of the benefit you gain from social media. Does it outweigh the negative effects? This post isn’t meant to tell you to completely stop your habits, but maybe reconsider them. If nothing else, be aware of how much you are checking your phone. If you can at least temper that, your relationships might be improved. On top of that, your health may be improved in the long term. Next time at the dinner table, maybe actively choose not to bring your phone and urge others to do the same. I think this is a very relevant article. The trend of having your phone out at all times is something that is highly prevalent at BC and among our generation in general. And you’re right that it is not so much as a “pause” to a conversation or interaction as much as it is a “stop.” This also reminded me of facts about distractions and how they affect our own daily lives. Here’s an opinion piece in the NYTimes that you may find interesting: http://www.nytimes.com/2013/05/05/opinion/sunday/a-focus-on-distraction.html?_r=0. That article makes me think of my Intro to Marketing class with Prof. Akinc- she had a no tolerance policy on cell phones because one study showed that if your attention is taken away, then it takes 30 minutes to get it fully back to where it was. 30 minutes in a 50 minute class is quite significant. I liked your article and really share your point of view. I sometimes purposely forget my phone for one whole afternoon, just to take a break, and I have to say it feels REALLY good. Just stopping for checking your phone every 5 min to see if you have a notification is a relief. I found this study reported by Today http://www.today.com/money/family-social-networks-together-stays-together-study-suggests-6C10687468 suggesting actually that families have better connections if they interact with each other on social media. 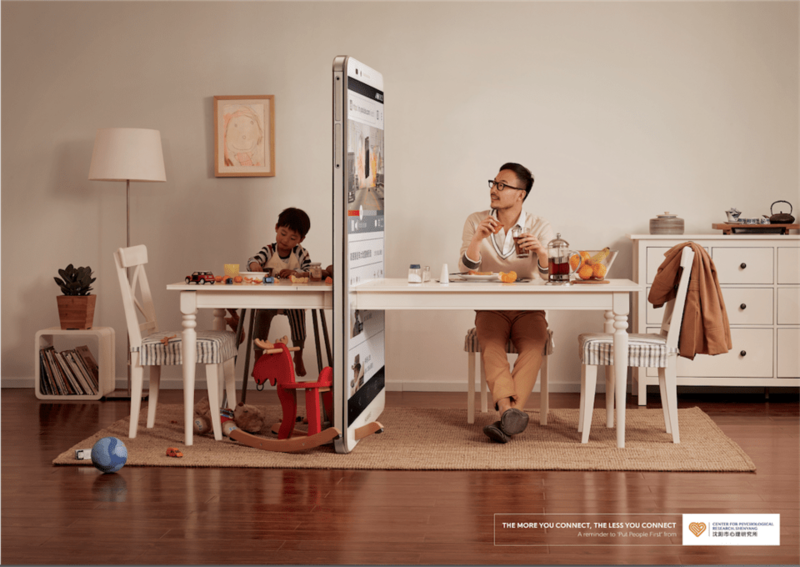 Why not, but I’m still convinced, that although it can be a good tool to interact, nothing replaces a good old family dinner, without any phone. Hadn’t seen that article before, but I really like it! I’m friends with many of my family members on Facebook and I love it and feel like I do have a better connection with them (especially extended family). I think this is a trending topic in class and blog posts/comments, and you did a great job highlighting some of the glaring repercussions of disconnected-ness. I went without a phone for several weeks at the beginning of the semester (it was a cracked screen repair, a blessing in disguise! ), and it was liberating. I checked my email twice per day: once in the morning and once at night. I was making more phone calls using my friends’ phones, cutting time away from texting and messaging and getting to the point of conversation more efficiently. The dinner table dilemma rings really true for me. I’ve mentioned this in a comment or two before, but I agree with you that we shouldn’t remove social from our lives. It’s going to be increasingly important, however, to temper our usage such that we keep our personal connections personal. It’s important to talk about the disadvantages of social media as you did in this post. Regarding that this class is about social media. I really have a love hate relationship with social media. Of course I’m a user of the social networks, at least the most popular. But I always felt it was distorting the reality. We tend to use social networks in a social environment. Everyone has been at least one that person standing in a corner during a party or any social event. Ironic right? Being the least social you can be in a social environment because of social media. I think we still have a long run until we can find the perfect balance between the online life, and offline life. Most of us tend to be in one of these extremes. Great post that made me think about the way I behave in those situations. Yes sometimes social media is distracting. I have built a habit of checking my social media accounts all the time in case of any comments or likes. I also keep my phone with me even during a family reunion–I know it is not good but I just can’t control myself. Social media brings us a lot of convenience, but I am also wondering whether we need more face-to-face interactions with the people we love or love us, instead of spending so much time on social media. We can’t get rid of social media, but we can control our time spent on it. Great post, I really enjoyed reading this as well as hearing about the statistics from the numerous studies you have found. I think the acronym FOMO (fear of missing out) has become an actual social issue and contributes to this constant phone checking at meals. Even my mother who barely knows how to use Instagram will sit on her phone at the table looking at mindless stuff just so she can stay current, as if 15 minutes are going to change this. I recently read a study that even those 15 minutes can create anxiety because we automatically feel like we are missing out on something with our friends or at work. If you get a chance, check out http://www.techtimes.com/articles/104417/20151109/fomo-leads-to-depression-and-anxiety-in-teen-social-media-users.htm. It’s rather interesting! I enjoyed this post a lot and I really couldn’t agree with you more. Like you, I am also guilty of this, but I wish I wasn’t. Whether I’m out with friends or eating dinner at home with my family, the experience is almost always better when our cell phones aren’t out because we don’t have to worry about that one person saying (after a 10 second pause), “Wait what’d you say? Sorry I was reading something on my phone.” This reminds me of that television commercial several months back where the family made each person put their phone in a bowl before dinner to support conversation and interaction, rather than staring down at a screen in front of you. I’m also not surprised at all that heavy mobile phone usage causes higher levels of stress, sleep disturbances, and depression, and if I had to guess I would say anxiety is on that list as well. But on a more positive note, great post! I just spent the weekend in Austin with my college best friends, and I noticed we did a pretty good job of not being on our phones. Of course, when you’re spending 72 hours with 4 people, you’re going to need a break from each other, so sometimes conversation died and we were all scrolling through something. I think it helps that we’ve only all been together 4 times in the past 5 years so we have a lot to talk about when we get together. In my normal social life, I’m definitely guilty of pulling out my phone in social situations. It’s something I’m really trying to work on, but I’ve not been as successful as I could be. Bravo jak, bravo. Interestingly, i think this phenomenon of “phone obsession” is actually a great litmus test that can help indicate what type of person you are dealing with. Obviously, the people constantly checking their phones are are the one who prefer to spend their life in the world of digital reality. in matrix lingo, they would take the blue pill. Luckly, their are people out there that can go days without a phone. they are the red pill poppers, the ones that prefer the reality of human connections over satisfaction from red hearts and thumbs up. these are the people we must seek out, these are the people that will help the human race from de-resolution. Really liked this post Jak. While social media is great in most aspects, I completely agree that sometimes we fail to consider the negative consequences it can have on our lives by devoting so much time to it. I actually read a book a few years ago called “A Deadly Wandering” that told the story of a young man who accidentally killed someone else after he got in an accident from texting and driving. The book really broke down just how unconsciously addictive cell phone usage can be and I think social media use can be seen in the same way. A lot of the time we just check Facebook or snapchat without even thinking about it, almost like zombies. I definitely agree with your overall theme that sometimes we should take a step back and consider how we use social media in certain circumstances. Depressing post to read. I am thankful that I am old enough to have not had a phone until high school and not had mobile social media until I was going into my senior year of highschool. This will continue to be an issue and will only get worse. Thankfully my family has always had a no phones during dinner policy with absolutely no exceptions. I think it would be a very healthy step for more families to make, especially as social media become more prevalent. In a world that can be instantly connected by the tap of a finger, why are we becoming more isolated and lonely? I appreciate your blog because this has been an issue on the rise in terms of people spending more time interacting with the people outside of their immediate vicinity. Though I am by no means anti-social media, I am concerned about millennials and whatever we call teenagers and younger these days because face-to-face interaction, at least to me, is the most rewarding connection there is. Definitely agree with you, great post. I actually am consciously trying to to back myself off my phone when I’m out for dinner. Often I’m so busy with things that I can’t put it down. and it seems like the people around me may not be talking anyway so i check in on things quickly. Then I realized, maybe they are conditioned to be quieter because I am on my phone. Kind of a chicken and the egg situation. I feel that is becomes a natural reaction to whip out your phone even when you don’t need to do anything, then you get trapped. I would actually love an app that would lock my phone for atlas a half hr when I’m out for dinner and condition me to not grab it. I love this post, Jak. Having just spent the long weekend with my family, I can wholeheartedly relate to how you feel. I angrily banned my mom from taking pictures of our food when we were out to eat, and I found it difficult to find the words to explain why I felt that it took away from the conversation, the atmosphere, and the experience– I think you did an amazing job of that in this post. We’re certainly all guilty of letting our phones distract us, and, as you put it, detract from our interactions. I don’t think it’s necessarily fair to say that we’re becoming incapable of genuine social interaction as a result, but I do think it’s making anti-social behaviors more common and the norm. I think it helps to identify the times and circumstances when phone use doesn’t add value, it only takes away, and to hold yourself to avoiding your phone then. I love that you referenced Prof Akinc’s policy in a reply above– that is a spot-on analogy for how cell phone use really affects conversation. Hey Jak i enjoyed this post. I also dislike the fact that we are always on our phones and are not being present. 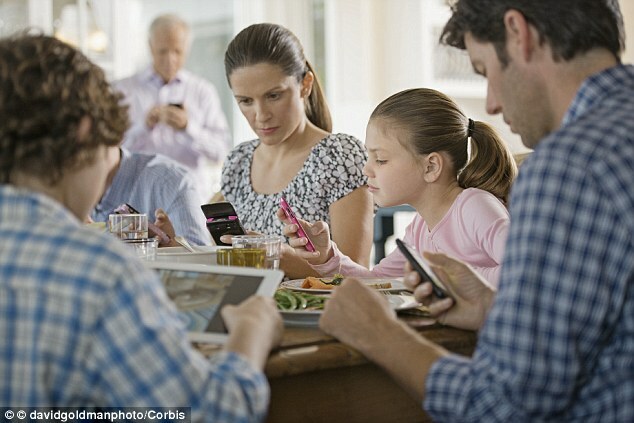 People being on their phones can really have a negative effect on human interactions and social activities. I think that our generation may be the last one to be able to control our use of smartphones because we did not grow up using them. Kids that grow up using smartphones and social media have never known a time without it. Wow, great research, Jak. This topic comes up a lot in classes, but I’ve rarely seen it discussed with so many resources. I particularly like the VTech study and the Pew Research study that shows 88% of people do not think cell phones should be at the dinner table. I also appreciate the time you took to respond to comments — great work!